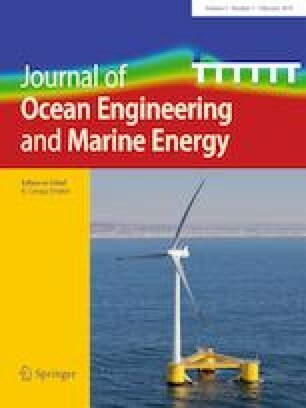 This paper investigates the energy extraction of three types of wave energy converters (WEC) arranged in arrays and subjected to multi-directional seas of different wave spreading. The changes in the wave climate observed in the neighborhood of the arrays by their energy extraction were also reported. The hydrodynamic software, WAMIT, has been used to generate the performance of the WEC arrays in regular waves, whereas, a post-processing programming code developed in-house has been used to generate the device arrays’ performance in multi-directional seas characterized by single-peaked (JONSWAP and Bretschneider) and double-peaked (Ochi–Hubble) wave energy spectra. The results showed interesting findings on the WEC array performance and change in the wave environment around the devices, both strongly depend on the wave energy generation mechanism of the WECs and the wave spreading. The results obtained from the multi-directional seas with double-peaked wave spectrum showed significant differences in the energy production performance by the WEC arrays to those with single-peaked wave spectra. The uni-directional seas resulted in a larger q-factor. The q-factor differed with the peak wave periods, and at small wave periods, the q-factor for the terminator and attenuator WEC arrays are found to be higher than their counterparts for the point absorber WECs. With reference to the wave height modification in the neighborhood of the WEC arrays, the attenuator generated a greater wave disturbance followed by the terminator and point absorbers. The online version of this article ( https://doi.org/10.1007/s40722-019-00127-w) contains supplementary material, which is available to authorized users. The authors are grateful for the financial support of the UK Engineering and Physical Sciences Research Council (EPSRC) through the EcoWatt2050 research consortium (EPSRC Reference: EP/K012851/1).